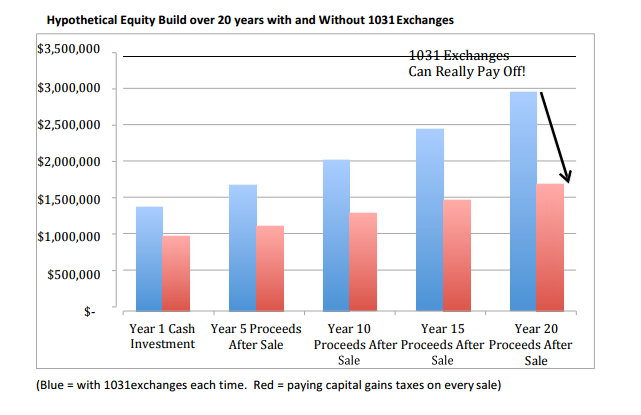 The example below shows you a hypothetical analysis of the cumulative effect of how an investor’s equity could potentially grow over time if they performed 1031 Exchanges every 5 years into new properties, and if they didn’t utilize 1031 Exchange at all. In the right column of this example, the investor pays capital gains taxes on each property sale and then reinvests in new properties. In the middle column, they utilize 1031 Exchanges for every property sale and subsequent purchase. If the investor is smart and takes advantage of the tax code, they will perform 1031 Exchanges with each property sale and potentially grow their equity to just over $2.9M over 20 years. is merely a hypothetical example, and may not be indicative of individual investors results, which may differ. A 1031 exchange can be an effective tool for building wealth. However, investors must work with their professional tax advisor to meet the requirements of IRC Section 1031, as failure to comply with IRC Section 1031 or an unfavorable tax ruling may cancel deferral of capital gains and result in immediate tax liabilities, including tax penalties.